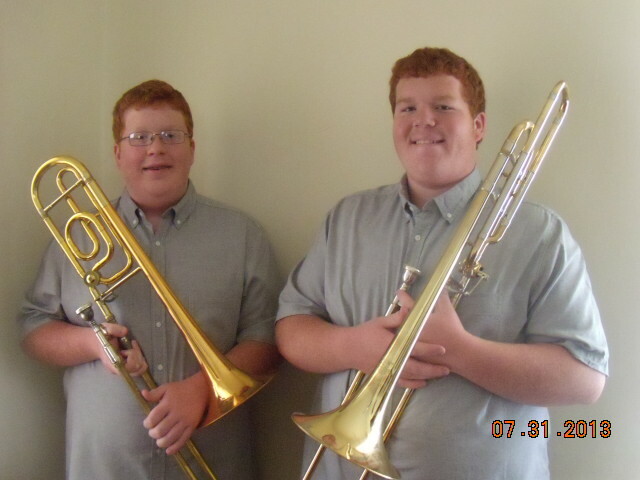 When Alan and Gary’s musical careers began as fourth graders, both vocally and instrumentally, who would have ever guessed that music would prove to be a “gift” for them both as they both excel as trombonists. Both Alan and Gary participated in concert band and Show Choir at the elementary level as well as con-cert, jazz band and ensemble in middle school. Alan and Gary were both selected to represent Derry Area Middle School at the county, district and collegiate level consecutively during grades 6 through 8. Alan and Gary both competitively auditioned for Seton Hill’s Youth Honor Concert Band and subsequently participated with the Westmoreland Symphonic Winds Orchestra. Gary further auditioned and was selected to play in the Seton Hill Youth Honor Jazz Band as an eighth grader. Alan and Gary also participated in County and District Chorus during the course of their middle school career grades 6 through 8. Gary was recognized and awarded with a Principals Award at his eighth grade award ceremony for his vocal and instrumental achievements, nominated by his chorus and band teacher. As a high school student Alan’s gift of music was apparent and continued to flourish. Alan was selected to represent Derry Area High School all four years at the county and district level, ultimately advancing to the region level while fulfilling his dream at the Pennsylvania All-State level. In the meantime, Alan was selected to participate in the IUP Honors Band as well as the Pennsylvania Music Educators District I Honors Band. Not missing a beat, Alan participated in Marching Band, Pep Band, and Pit Band when he was not busy with choir, ensemble, musicals, soccer, trombone lessons, ranking as an Eagle Scout, school organizations, scholastic achievements, volunteering, and work. Alan enjoys playing his acoustic guitar for leisure. Two weeks after graduation Alan was recruited to be a member of the Derry Area Alumni Brass Band and participated at a concert at the Amphitheater. Alan has been called upon many times to play his trombone in community-based orchestras, ensembles and quartets. Alan was recognized as Music Student of the Quarter as a junior and senior and received the Director’s Award at his senior concert band concert in recognition of his outstanding musicianship and leadership skills. Alan was the recipient of the prestigious Arion Award at his senior chorus concert, an award that is awarded to a choral student selected by his peers who they deem as a vocalist has demonstrated outstanding musical achievement. Alan has received numerous medals, trophies, certificates and plaques as keepsakes for his musical accomplishments and achievements. Prior to budget cuts in education, Alan wanted to pursue a degree in Music Education. Alan will continue his musical career at St. Vincent College as a member of the St. Vincent College Bearcat marching band while searching for more musical opportunities. Following in his big brother’s footsteps and deter-mined to make a name for himself, Gary will begin his high school career as a member of the Derry Area High School Marching Band. Gary also plans to participate in concert band, jazz band, choir, ensemble, and musicals while pre-paring to audition for PMEA Honors Band, county, district and region band in pursuit of acquiring a PA All-State Concert Band medal to add to his collection of existing medals and certificates. Gary is in the process of preparing to rank as an Eagle Scout, play soccer, and he is excited to think of what the next four years has in store for him musically. Was it irony that Gary set out to be a fiddle player at the age of eight (prior to the onset of an unexpected illness) or coincidence based on recent genealogy discovery? The New Gray Boys: Gary (left) and Alan (right) Gray. By Cathi Gerhard in Feature Stories on September 18, 2013 .